How it happened: Indiana was in Friday night’s game in East Lansing through the first four minutes. And then the rout was on. After the Hoosiers led 10-9 at the 16:13 mark of the first half, the Spartans ripped off an 18-0 run to claim a 27-10 lead at the 10:39 mark. It was no contest from there. 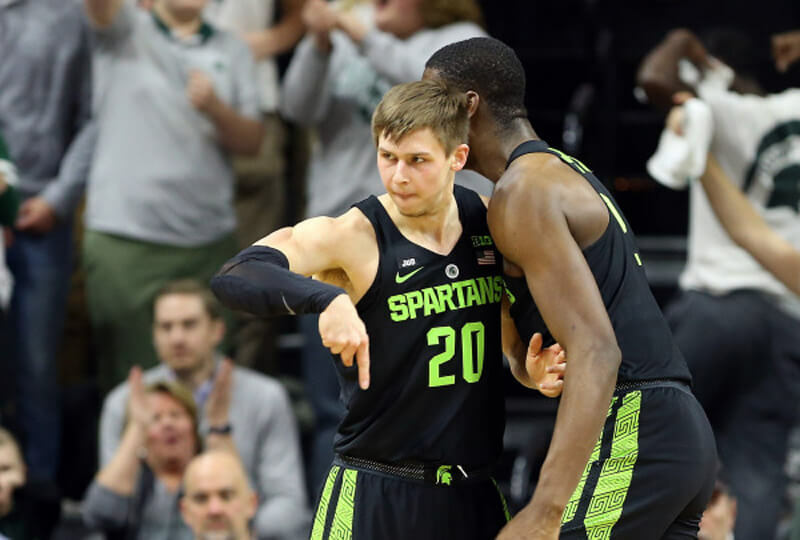 With five days off after Saturday’s loss to Michigan at the Breslin Center, it was no surprise that Michigan State came out strong. And with Juwan Morgan basically a non-factor and on the bench for the final 24 minutes with an ankle injury, Indiana was simply no match. IU’s three-game Big Ten winning streak is over and the Hoosiers have just two days to prepare for Monday’s home game against Maryland. Standout performer: Robert Johnson was Indiana’s lone bright spot offensively as the senior guard finished with a team-high 21 points on 7-of-13 shooting. Johnson scored eight of Indiana’s first 10 points. 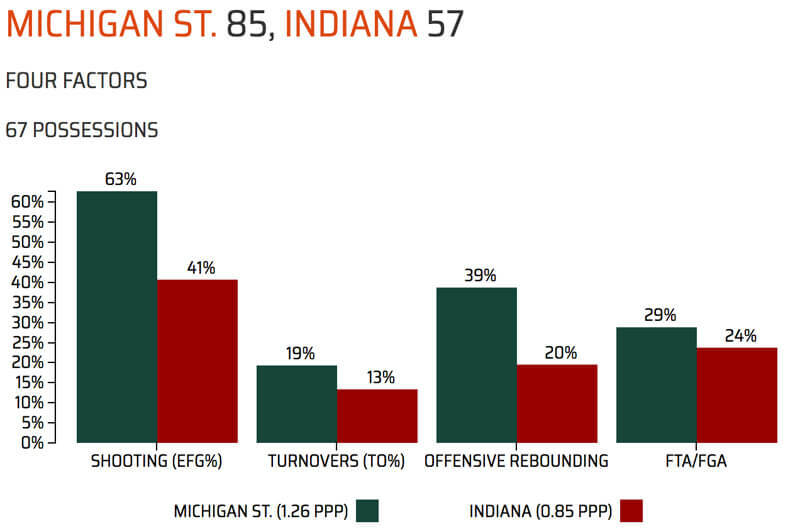 Statistics that stands out: In the decisive first half that ended with Indiana down 19, Michigan State outscored the Hoosiers 12-0 on points off of turnovers and 9-0 at the free throw line. I am sure there will be many negative Nancys, salty Sallys, and Debby downers after today’s loss, but the fact that we were in a position to win with 5 minutes left is a testament to our improved defense. If JM had been in the game, we could have been in it until the end. JS continues to be a bright spot and RJ seems to have found his rhythm again. If it wasn’t for that 0-18 run at the beginning of the game, we would have only lost by 11. Holding them to their season average was a great accomplishment that, albeit, not many other teams have managed to do this season. I really like our team…we just kept going. I learned a bit more about Izzo tonight as well. With 2:29 left, and a 32 point lead, he pulls the starters. What a gentleman. It really showed that IU has a long way to go to be at the top not only in the Big Ten but also the country. 1. That first half was frustrating regarding the officiating – particularly with the non-calls on our offensive and defensive end. 2. JM going out. Killer. 3. ROJO – I think he’s turned a shot making corner AND he needs to be much more selfish on the offensive end. What are you talking about? We were down by 20 pretty much the entire game. I didn’t really think we would win but was hoping it would be closer. We don’t have the studs to play with them. I was pleased we kept working and glad to see Smith and Moore play a lot of minutes. It is really going to be tough if JM is out for awhile. Rob starts hitting and Hartman goes stone cold. That’s not good. I noticed JM slowing down in the first half and thought it was out of frustration and then bang. Worst part of this loss. Hope our boys is ok. Next man up is becoming this team’s mantra. I hope that was meant sarcastically! LOL! PS: He left one in. Just trying to stay positive. Comments are all I have to look forward to this year. Hey, we were within 6 or 7 4-pt plays in the last 5 minutes. LOL. MSU dominated inside. That was the game. Better and stronger bigs. RJ was great. Would love to see Colin’s shot return. Maryland at home will be key. Hopefully JM will be back. Yep. At least one, maybe two lottery picks if Ward keeps playing as he is. Three first round picks with Jackson thrown in. And MSU was primed to play! We literally had nobody over 6’7 after JM went out. I don’t count poor CM. He tried, but he was thrown around like a rag doll by their bigs. Edit: I forgot that Collin is 6’8, but it really doesn’t change the idea. The first part was heart felt. The second part….yep! I mean I kinda felt the game was out of reach for us at that point too. necessary adjustments to improve his game. I’m sure looking forward to Robert Phinisee. We are so lacking in point guard play. Newkirk kind of reminds me of a Chris Reynolds that can’t pass well or play much defense. When he is leading the team in FGs attempted, that’s a really bad sign. Hmm hook shot from half court may not be the remedy, but if that’s his game, who am I to judge. Proud that the team didn’t quit tonight. Earlier in the season they would have lowered their heads and mailed it in. Let’s hope JM is okay for Maryland. Was nice to see RJ give it his all and be a team leader out there on the floor. Nice to see his shot start to go in. This team is just to small inside and players getting hurt doesn’t help. Hopefully Morgan will be OK. We will definitely need him down the stretch. Hang in there Hoosiers. Things will get better but this year is going to be hard. Not a big surprise. Izzo had almost a whole week to get Sparty lathered up. You knew IU would get their best shot. Just have to move on. What ever your smoking send some my way!!!! Devonte is probably the best passer and creator on the team, but he can’t stay on the floor long enough due to defensive lapses and decision-making. I think his shot would start falling with some consistent minutes. There are minutes at guard to be had, but no one is stepping up to take them. Hartman needs to shoot threes off the pass, not stepping back or trying to create his own space. His game is a lot like mine (um sorta), good pass and I am 50-60% 3-Point shooter is my awesome pick up games twice a week. When I am not getting passed the ball and start hunting my 3 pointers, I must shoot like 15% or less (ok, probably less). I’ve been watching Hartman on this point since I noticed it he similarity to my game,. When he tries to do anything but catch and shoot, it’s going to miss badly. When he gets a pass, there is a real good chance it’s going in (like Wisconsin game). They almost need to run plays for him, but I don’t think it’s in the cards. Not a real surprise considering we were outsized and you had to figure that Izzo would try and take Morgan out of the equation. Our lack of depth in the middle proved to be a huge factor. Michigan State should be a top tier team. Tonight they looked like it. Hartman works best in space and if he can’t hit – he’s going to struggle. ROJO can drive and create his own shot AND he needs to be better about finding his opportunities. To MSU’s credit – they physically moved us around. I don’t guess it matters how it happened at this point, but it’s especially frustrating to me that Morgan gets hurt on a play where Ward deliberately pushed him pretty hard in the back and caused him to be off-balance. That no foul was called was just salt in the wound. Morgan left the Breslin Center on crutches. That’s the worst thing. I don’t think we can beat Maryland Monday without him. Great point! If he took 17shots as JN did (most on the team-why I can’t figure out) , I think he could make more than 5 and better than 4of 12 from three. Someone needs to get on him to shoot and quit passing up open looks. Also, JN 3 assists from your point guard and 2 to’s ,needs to pass first and never shoot unless shot clock at 1 second. Michigan State hacked us all night long and not a single MSU player was called for more than two fouls. Are there two Kohl Centers in the Big Ten? JM was injured on a non-called foul (go back and watch the tape, Ward bodied him badly). The MSU guard who drew Rob’s second foul, the allegded charge, was just awarded for his acting with that flop. IU actually boxed out well on the boards tonight, but the refs allowed the taller MSU front court to go over-the-back all night long. Breslin is notorious for non-calls against MSU. Yep. If you go back and watch the play, Ward goes up with his right hand to contest the shot, but he put his left hand in Morgan’s lower back and pushes pretty hard. When you have a highly ranked team..Final Four potential and two likely lottery picks still on the floor with 3 min left and a 30 pt lead..the word “dumb” has a place somewhere.in this narrative. MSU clearly fields a great team this year, and should beat us pretty handily tonight. Why would refs still call a game like that? To Phinisee and the rest of the newcomers. Besides Morgan and Smith I think most of the minutes will go to the rookies. I stumbled across a draft projection this morning and was surprised to see Jackson going 7th. 6’11 frame destined to put on additional muscle with that touch from three will project. Although, I’m not sure about his dribble drive game. Our guy Collin is listed at 6’7. I think I’m going to blame the ref’s for JM’s injury, letting the game get out of hand in the first 1/2 was absurd, I thought I was watching a football game. No doubt we were outplayed by a superior team, but I thought the foul officiating in the first half was atrocious. The referees’ unwillingness to call typical fouls in the paint may very well have led directly to Juwan’s injury. When you let the game get out of hand, these things can happen, and it truly dismayed me. Most of his shots were while he was open……and with the way that M.St. plays D I think we know why he was ” allowed ” to get open.